This self-post was originally posted to /r/MegaMegaMonitor. See more things from Dan's Reddit account. I’ve just pushed out version 95; you can get it by telling Greasemonkey to update manually, or just wait a day or so and you’ll get it automatically. This release makes some minor CSS improvements to help make the tooltips visible even on awkward subreddits (still a long way to go, though), and also adds a powerful new tool that I hope will be useful to those of you who like to help your fellow MegaPeople to ascend the ladder. Here’s an example. Suppose I enjoyed /u/glitzyjan‘s comment, sharing a video in /r/MegaMegaLounge, and would like to give them gold and help them climb the ladder. MMM tells me that /u/glitzyjan is already in /r/MegaLoungeV, so they’d probably appreciate my gold better if I were to go and give it to some arbritary post of theirs in /r/MegaLoungeV, but it’s a bit of a drag for me to go all the way through their post history just to find them saying something in /r/MegaLoungeV. That’s where this new feature comes in: it does the searching for me. It’s not much faster than I am, but I can kick it off in a separate tab and then come back to it in a few minutes. First, I click the new MMM Options/Tools link in MegaMegaMonitor. Then I fill in the form to say that I’m looking for a post or comment by /u/glitzyjan in /r/MegaLoungeV and click Search. MegaMegaMonitor will then start exploring as fast as it can through /u/giltzyjan‘s post and comment history and reports back on what it sees. Like this! It’s very rough around the edges right now, but I’ve been using it over here for the last couple of days and it functions, even though it’s ugly as sin, so I thought I’d share it with any of you that want to try it out, too. And if you don’t: well that’s fine too, just ignore it. But I think this new feature could be very useful for folks like me who sometimes like to reward good posters by gilding them in their highest lounge, rather than just where they produce the great content. Tip: if you’re happy with the results you’ve got e.g. you’ve found what you’re looking for, click “Stop searching.” Or it’ll keep going until it’s read the entire post and comment history of your target, which will take a long time and will start to slow your computer down! This is a slow operation because I can’t pre-cache it all for you like I do the other parts of MMM (because I don’t know what you’re going to search for in advance! ), but it should still be faster than doing it by hand, which many of us do already! tl;dr: New tool lets you search for posts/comments made by a particular person in a particular subreddit. Great for chain-gilders. I just sold a flat and bought some creddits. Who wants gold? This self-post was originally posted to /r/MegaLoungeVIII. See more things from Dan's Reddit account. Today, I just agreed the sale of the flat (that’s “apartment” outside of British English) that I inherited from my father (who died three years ago yesterday), and I’m marking the occasion by splashing out on a pack of 36 creddits to fuel a gold train. /r/MegaLoungeVIII‘s getting crowded. Who wants to come up to /r/MegaLoungeIX? This self-post was originally posted to /r/MegaLoungeIndia. See more things from Dan's Reddit account. Sorry, /u/Greypo – the stats generator doesn’t work for you because there exist MegaLounges that you gained access to out of order! Hope that provides some amusement and diversion to you all. This link was originally posted to /r/MegaMegaMonitor. See more things from Dan's Reddit account. As requested, double-clicking on a piece of flair will now take you to the relevant subreddit (with one exception that probably nobody will ever find anyway). When clicking “check for update?”, upon successfully updating the age of the data downloaded to your computer is updated immediately, rather than after the next page refresh. Updated version is on its way to the server now; give it 10 minutes and then update, or wait and your computer will update MMM for itself within the next 24 hours. CMC, what is this about? This self-post was originally posted to /r/ClearMyConfusion. See more things from Dan's Reddit account. I’m confused as to how this differs from e.g. ELI5. What’s the difference? This self-post was originally posted to /r/MegaLoungeVII. See more things from Dan's Reddit account. 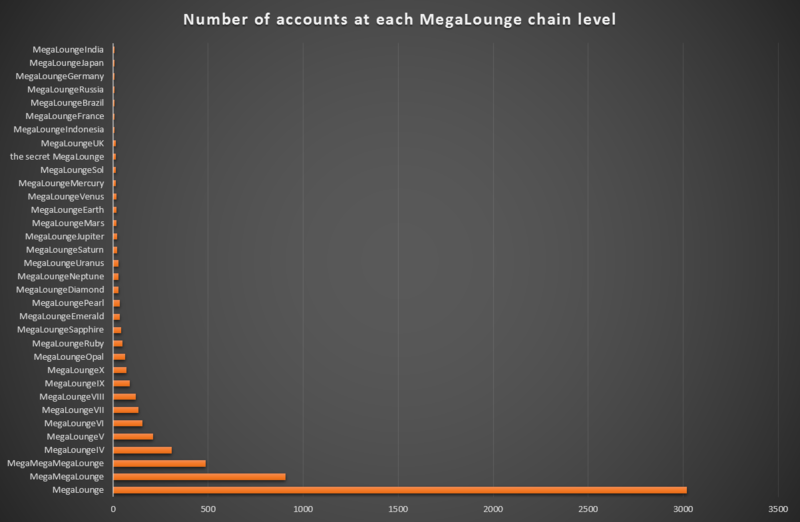 There are 3,020 accounts authorised to access /r/MegaLounge, 906 in /r/MegaMegaLounge, 487 in /r/MegaMegaMegaLounge, 307 in /r/MegaLoungeIV, and similarly fewer and fewer in each subsequent lounge. There’s a mini “tipping point” after /r/MegaLoungeUK, for some reason – did everybody who got that far just decide to stop? 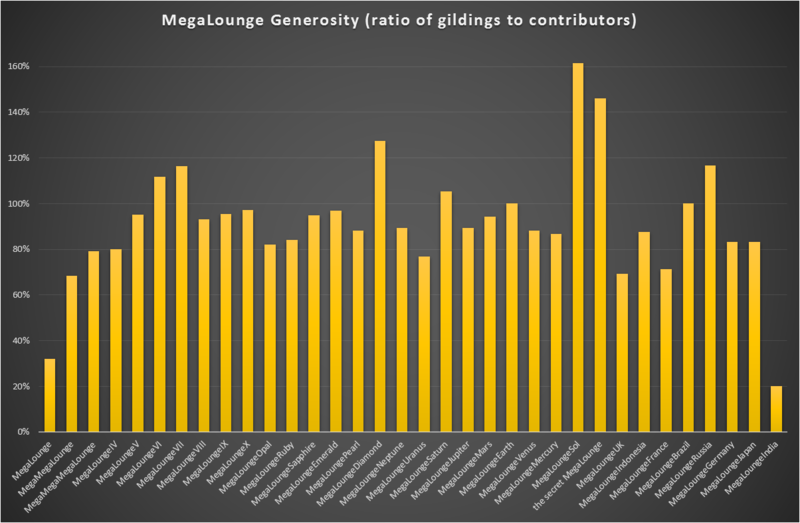 …if we take the ratio of the number of gildings per MegaLounge to the number of accounts in that MegaLounge, we get a ‘generosity score’, and that’s not so clear-cut. The most generous MegaLounges are /r/MegaLoungeSol and the secret MegaLounge, followed by /r/MegaLoungeDiamond, /r/MegaLoungeRussia, /r/MegaLoungeVII, and /r/MegaLoungeVI. I wonder if these are also the lounges with the least content? Perhaps they’re places that people stop off at only as a steping stone on their journey? 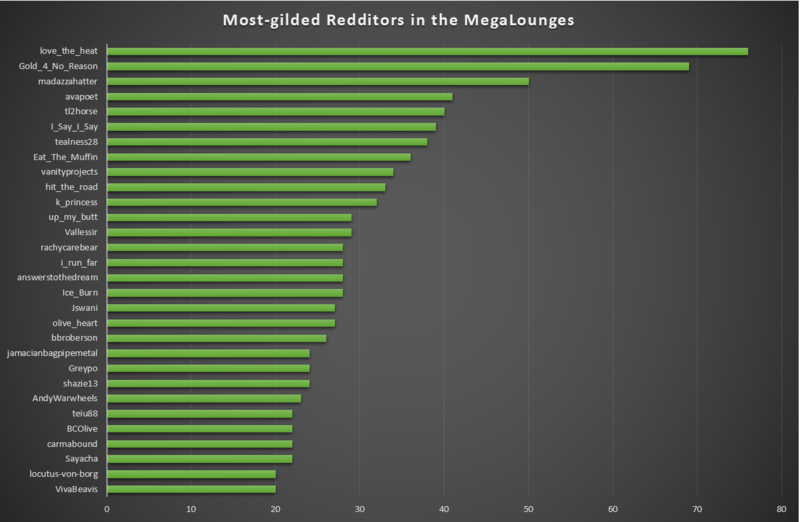 The least-generous MegaLounge is the latest one, probably because there’s nowhere to go yet as a result of being gilded there, but the second least-generous… is /r/MegaLounge itself! I feel like I should go there and gild some people, just to buck the trend! 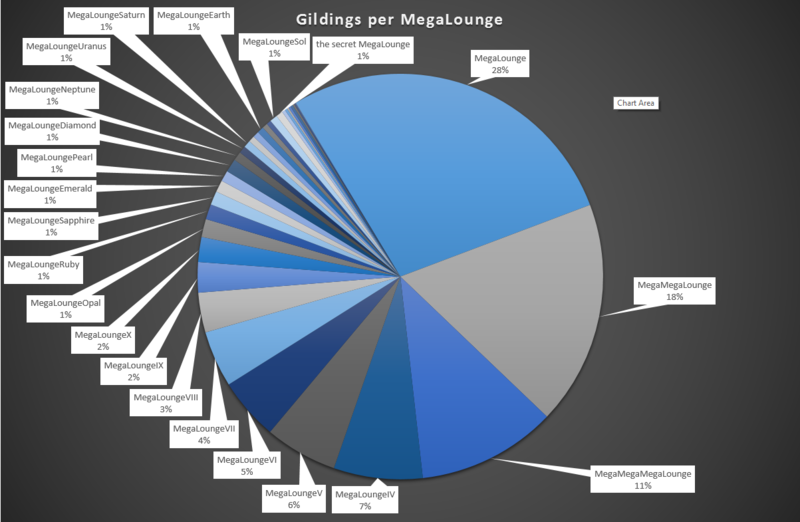 It’s possible to get from /r/MegaLounge up to /r/MegaLoungeIndia with just 33 gildings, but nine Redditors have impressed others with their MegaContent so much that they’ve attracted significantly more. /u/love_the_heat leads the way with a massive 76 MegaGildings, followed by /u/Gold_4_No_Reason and /u/madazzahatter (there’s quite a gap, then, before I come in at fourth place). This is all just something fun I threw together while I’ve been off work sick today. If there’s anything else that anybody would like to see extracted from MMM’s data, let me know: it’s all interesting stuff! MegaLoungeSol is the most-generous MegaLounge (highest gilding-to-member ratio) in the entire chain! Congratulations! This link was originally posted to /r/MegaLoungeSol. See more things from Dan's Reddit account. I’ve run some statistics on MegaLounge chain membership, gilding levels, generosity and whatnot, over on /r/MegaMegaMonitor, if you’re interested. There’s pretty graphs! This link was originally posted to /r/MegaLoungesArmy. See more things from Dan's Reddit account. 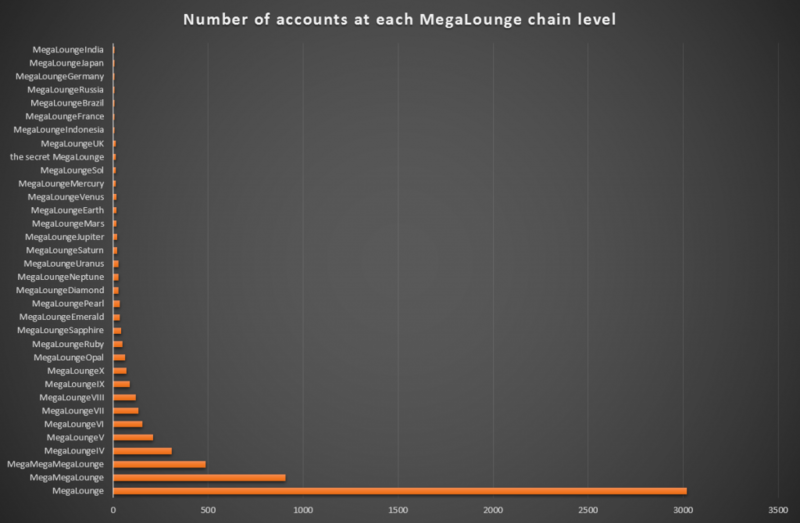 There are 3,020 accounts authorised to access /r/MegaLounge, 906 in /r/MegaMegaLounge, 487 in /r/MegaMegaMegaLounge, 307 in /r/MegaLoungeIV, and similarly fewer and fewer in each subsequent lounge. There’s a mini “tipping point” after the x28 MegaLounge, for some reason – did everybody who got that far just decide to stop? It’s possible to get from /r/MegaLounge up to the x35 MegaLounge with just 33 gildings, but nine Redditors have impressed others with their MegaContent so much that they’ve attracted significantly more. /u/love_the_heat leads the way with a massive 76 MegaGildings, followed by /u/Gold_4_No_Reason and /u/madazzahatter (there’s quite a gap, then, before I come in at fourth place). Hey, my favourite beta testers. Got a new version of MegaMegaMonitor for you to play with, and now it’ll help you keep an your gilded drunk (and other!) mega friends, too! This link was originally posted to /r/MegaMasonsLounge. See more things from Dan's Reddit account. [Off-topic] I’ve made a tool that helps /r/MagicSecrets folks find one another. This self-post was originally posted to /r/MagicSecrets. See more things from Dan's Reddit account. Please forgive the non-magic talk, but I wanted to share with you something I made recently. 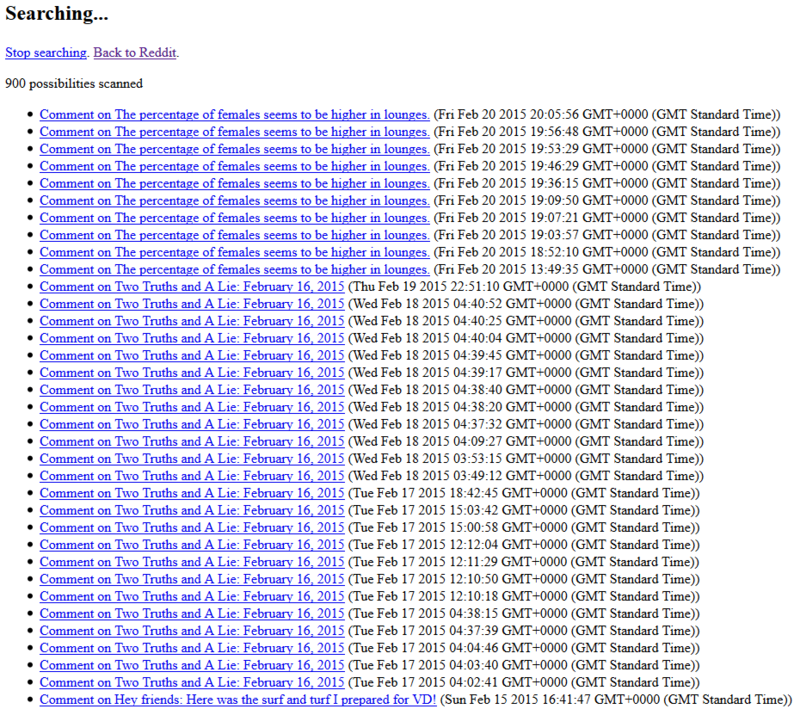 It’s a plugin you can install into your web browser that does this (pic). What’s that? It’s a top hat and wand alongside the name of /r/MagicSecrets folks. It’s only visible to other /r/MagicSecrets folks, of course, but it’s visible from anywhere on Reddit. So you can instantly spot fellow magicians whether they’re hanging out on /r/AskReddit or just commenting on kitten pics on /r/aww. What it’s especially useful for is spotting folks in e.g. /r/magic when the discussion gets close to something that should only be talked about in here. 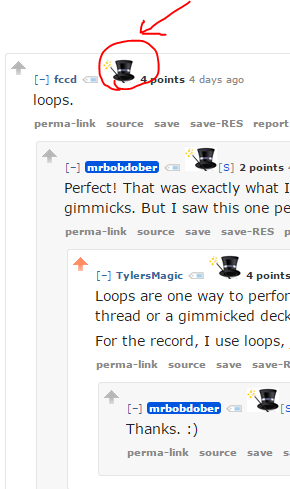 You instantly know whether you should say “let’s go talk about this in /r/MagicSecrets” or whether you should simply say “this isn’t the place to talk about this.” But honestly, these last few weeks I’ve mostly just been using it to give me a smile when I spot magicians elsewhere: like when I noticed /u/Jokers247 in /r/ImGoingToHellForThis earlier this week! Want to try it? Instructions are over on /r/MegaMegaMonitor. Apologies again for the off-topic post. Hi there. I’m /u/avapoet, and I made MegaMegaMonitor. This self-post was originally posted to /r/MegaMegaLounge. See more things from Dan's Reddit account. What Mega*Lounge level people have reached (if they’re in the same or lower level than you), or that they’re higher if they’ve gotten higher than you. That’s really useful when you’re gilding people! If you’re in one of a set of special secret subreddits (including the MegaLounge chain), it’ll help you to identify your (Mega! )-friends elsewhere on Reddit. It’s a great way to help build communities, because you’ll start “recognising” people that you’ve seen in the Megas (or… “elsewhere”) in the normal subs. It’s a browser plugin that works on most desktop and some mobile platforms, and you can install it here. If you give it a go, let me know how you get on and come chat with the rest of us about it, over in /r/megamegamonitor. There’s also a new numbering scheme, which will be necessary to help support the way in which new subreddits will be added to MegaMegaMonitor in future. If you’ve already got it installed, it’ll probably update itself within a day or two. Or you can update it sooner by asking Greasemonkey/Tampermonkey to “check for userscript updates”. If you’re new to MegaMegaMonitor (or if that didn’t work), instead go to https://danq.me/megamegamonitor/ and click the button to install it afresh. Doesn’t throw error messages if you try to use it while not logged-in at all. Continues to work in your sock puppet accounts with the cached data from your primary account. New “MMM” text in top-right corner (near your username). Hover over it to see if your data is up-to-date and refresh it if necessary (note that there’s a known bug where new installations say that it was updated “45 years ago”: probably an epoch problem but purely cosmetic). Added /r/MagicSecrets, /r/gildeddrunk, /r/gildedtrees, and two extra-special secret subreddits to the icon list. Added a feature that will show you an icon next to the usernames of other people who use MegaMegaMonitor. Improved automatic data updates so that they’ll always be triggered when upgrading to a new version of MegaMegaMonitor, to reduce the future risk of ‘sync errors’.